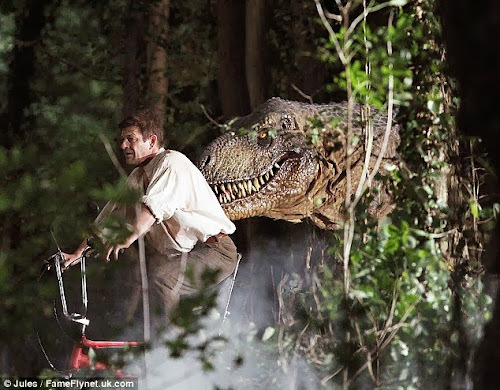 If you were being chased by a terrifying tyrannosaurus, a small red bicycle wouldn't be many peoples first choice of transport. 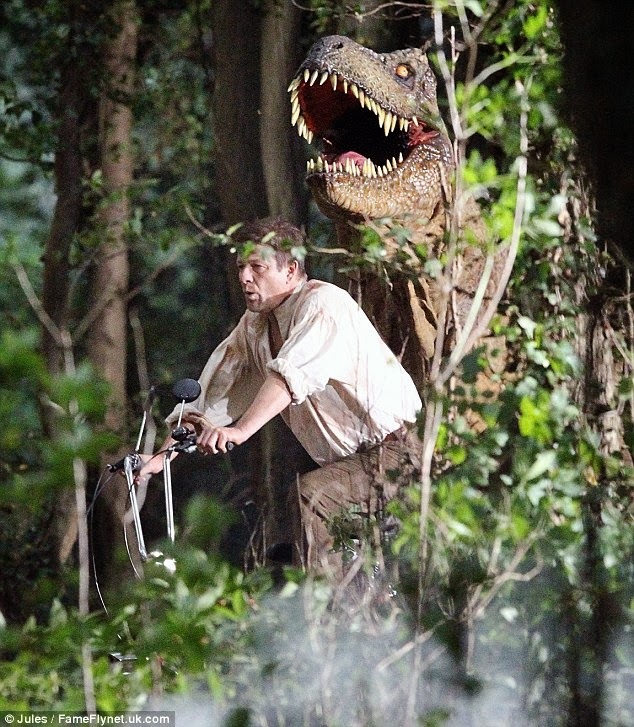 However, that is exactly what Sean Bean was riding as he filmed scenes for his latest blockbuster in the Kent countryside. The actor looked remarkably cool despite his sticky situation, and instead appeared to be enjoying spending time on the vintage chopper. It has not be revealed what the Game of Thrones star was filming, but one things for certain it looks set to be a thrilling tale. At one point a pirate is seen wading through the trees brandishing a sword, but whether he was helping or hindering his co-star, is not quite apparent. 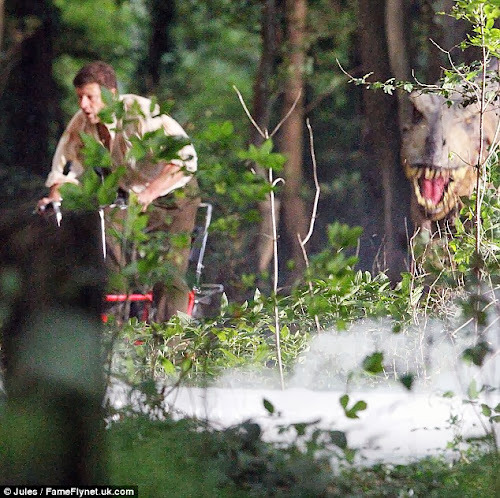 During the scene, Sean actually manages to gain some distance between him and the dinosaur despite his pathetic get-away wheels. The 54-year-old was wearing a loose-fitting shirt, brown trousers and brown, leather boots for the scene. The Lord of the Rings star is having a successful year after leading Britain in the nominations for the 2013 International Emmy Awards. He has received two nominations for his role as a cross-dresser in TV show Accused, which also saw its creator Jimmy McGovern shortlisted for best drama series. Sean was spotted taking a break from filming at the weekend, when he enjoyed a day out with girlfriend Ashley, daughter Lorna and her boyfriend. The star could well be serious about his most recent lady friend, who he was first spotted with at the very end of August. It had previously been thought that he had reconciled with his ex-wife Georgina Sutcliffe, who the actor was seen out with and looking rather loved up in June. But it must have just been a show of friendly affection between the two, as two months later he was seeing locking lips with Ashley at a pub near his Belsize Park home.